CBCA’s 2018 Economic Activity Study of Metro Denver Culture reported a record-breaking number of jobs in the arts hitting 11,820 in 2017. That’s a 10% increase over 2015. Employment includes full-time, part-time and contract positions in the metro area’s nonprofit cultural sector. This figure is comprised of a wide range of careers. As one would imagine, it includes sculptors, musicians, actors, opera singers, curators, scientists and educators. These are often highly-skilled professionals. Employment in the nonprofit arts sector also includes positions in fundraising, marketing, operations, finance and other levels of management. As the number of jobs grows, so does payroll. Personnel expenses in 2017 was $183.4 million in 2017, which is an 11% increase over 2015. In addition, payroll, seat and sales taxes were $23.4 million in 2017, an 18% increase over 2015. Since CBCA began collecting and analyzing this data in 1992, this report shows a 152% increase in total employment and a 193% increase in payroll. If all the 276 SCFD-funded nonprofit organizations in the metro area were combined, they would be the largest private employer. What is it like to actually make a living in the arts in Denver? 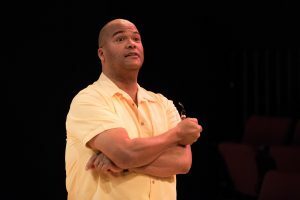 To answer that question, CBCA profiled Abner Genece, actor, teaching artist and member of Arvada Center for the Arts and Humanities’ Black Box Repertory Company. Abner Genece has been a professional actor and teaching artist for over 20 years. In 2015, he relocated to Denver after working primarily in the New York and Los Angeles markets. Working in the Denver arts sector presents its own challenges. As a contractor, one often has to juggle several jobs, in addition to securing work as an actor. For the most part, acting employment can be found in the theatre, as TV and film work are rather scarce in this market. Abner supplements his income by employment as a teaching artist for several organizations, including Kaiser Permanente Colorado and The City of Aurora. In 2017, he was offered a contract to join the Arvada Center’s new Black Box Repertory for its season of productions. This represented a wonderful opportunity, as he would a) have consistent employment for nearly 8 months, b) develop high-quality theatrical experiences with a committed professional team over an extended period, and c) develop relationships with members of the local community. For its talent, commitment and vision, the Arvada Center was honored with eight 2017-18 Colorado Theatre Guild Henry Awards, more than any other Denver arts organization. Outreach has always been a part of Abner’s mission as a performing artist. He’s found that when one can attract a growing audience with unique experiences, it can help create a sense of connection and goodwill in the community, as well as provide an economic boost to local businesses. This leads to healthy, vibrant, consistent exchanges with the public. He’s had the honor of personally connecting and developing friendships with patrons of the Arvada Center. This is a model that other Denver theatres, partnered with adequate resources, could provide in their communities. Abner has been offered another contract with the Arvada Center for their 2018-19 Season, which includes Denver’s much-anticipated production of The Diary of Anne Frank. CBCA is encouraged to see a steady increase in employment and compensation in the nonprofit cultural sector. This creative workforce is vital to the region’s economic activity and artistic vibrancy.